June 26, 2015 (LBO) – Sri Lanka’s government has signed two loan agreements with OPEC fund for international development on Friday to obtain a part financing for rehabilitation of a A5 road corridor from Badulla to Chenkaladi. The road which is one of the major highways linking parts of the Central Province to Eastern Province geopolitical zones of the country which carries the bulk of the traffic between Batticalo and Peradeniya via Badulla, the Finance Ministry said in a statement. 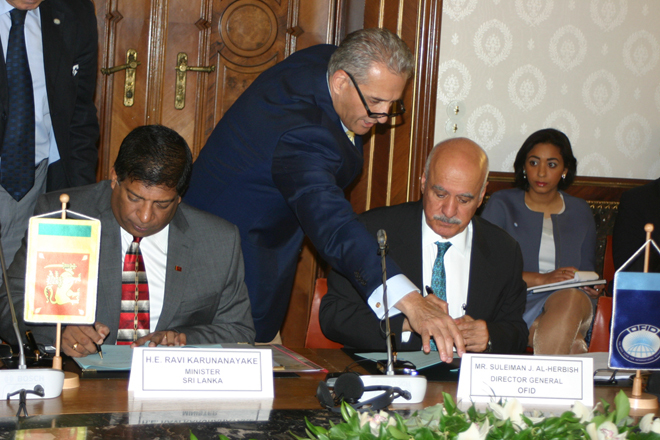 The total estimated cost of the project for rehabilitation of A5 road corridor from Badulla to Chenkaladi is 140 million US dollars and the financing agremment with OFID has signed to obtain a part financing of 60 million US doallrs. The balance would be jointly financed by the Saudi Fund for Development and Government of Sri Lanka. Interest rate of 2.5 percent and a service charge of 1 percent would be applicable for this loan which has to repay in 20 years period including 5 years grace period.